After leaving Jogyesa temple, we visited the nearby area known as Insadong (Hangeul: 인사동; Hanja: 仁寺洞). Insadong used to be an area where government officials lived, with large traditional houses. 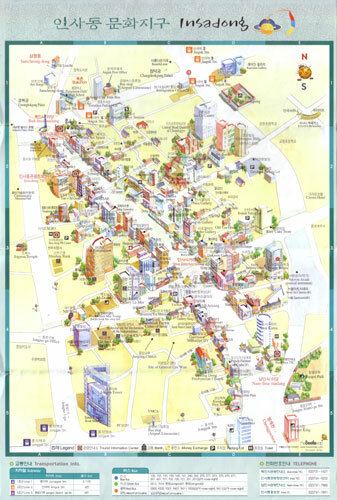 However, during the Japanese occupation the wealthy residents were forced to move out, and the area became popular as a marketplace for antiques. 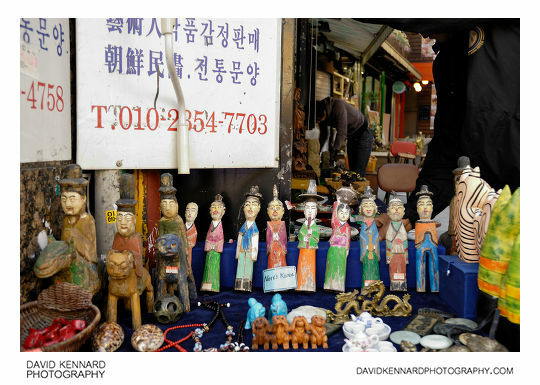 At one point it was the largest marketplace for paintings and antiques in all of Korea. Today it is still known for its antiques shops, but also tea shops, art galleries, and a wide range of other shops. 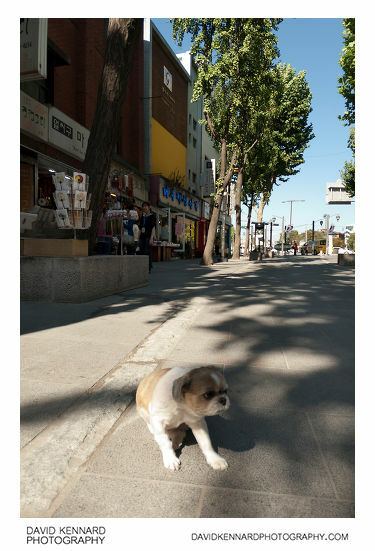 At the north end of Insadong there was this small dog out in the street by itself. 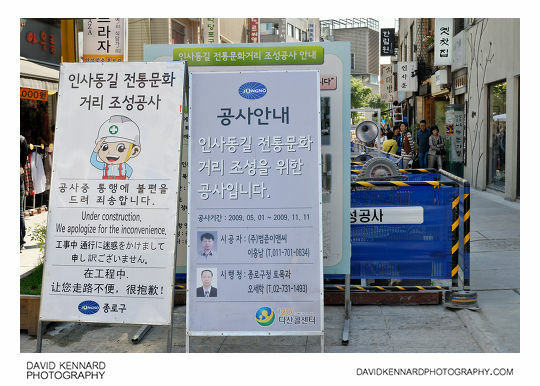 Insadong-gil isn't a pedestrianised street, but you don't seem to get many vehicles going down there anyway. I used my fisheye lens for this shot, which probably wasn't the best choice in hindsight. 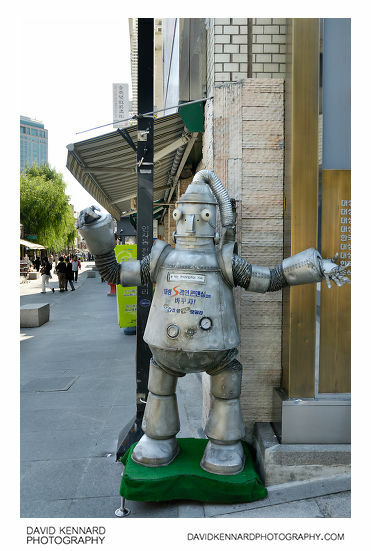 Outside one of the shops on Insadong they had this robot sculpture made out of a variety of scrap materials. Looking down one of the side streets coming off Insadong road, there was a small van coming down the road. 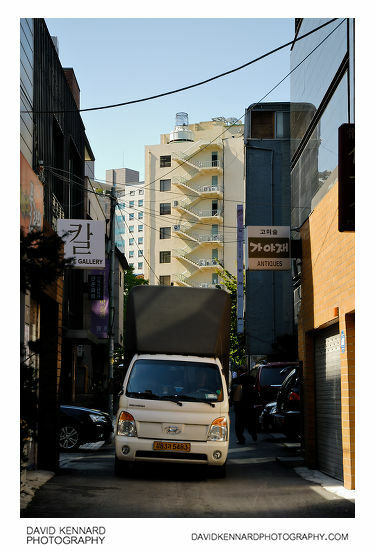 Many of the side streets are very narrow in Seoul, so small vans and motorbikes are usually used for deliveries. 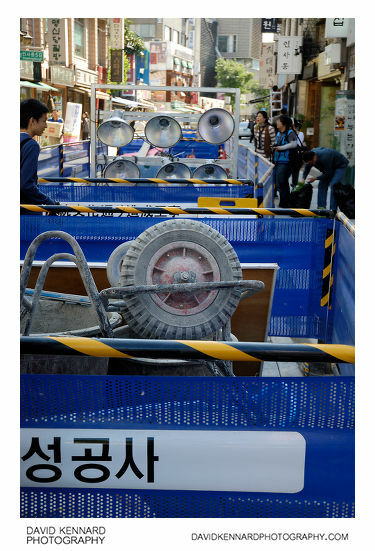 A bit further down Insadong-gil, they were doing some road works. I like the little cartoon builder they put on the sign. 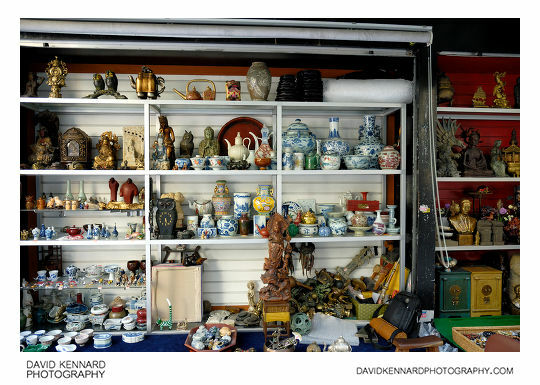 Above are some of the various 'antiques' for sale outside a shop in Insadong. 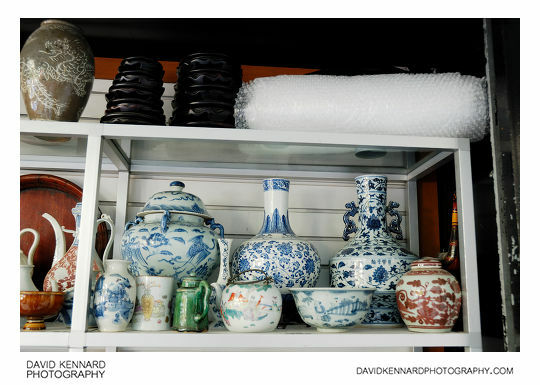 Below is a closer photo of the pots and bubble wrap at the top right of the shelves. Near the front of the shop they had these old wooden figures from North Korea. Presumably these figures were brought to the southern half of Korea before Korea was split into two, as I think you'd have a hard job getting them out of North Korea.